In the event of a family emergency, please contact the Camp Director. If you will be away from the numbers you have designated for contact, please let the camp know of your plans and itinerary. The parent/guardian of any camper requiring serious medical attention or hospital care, will be contacted by the Camp. The Head Cook takes great pride and care in the quality and quantity of food each camper receives daily. Meals are carefully planned with strong emphasis on variety and overall nutritional value. Most meals are served family style at the camp in order to place emphasis on table discussion and appropriate table manners. If there are any dietary restrictions, please let our cook and nurse know. Breakfast is served family-style by our senior camper waiters in the main lodge with hot cereal, yogurt, fresh fruit, and juice to start the day. The main breakfast course varies from blueberry pancakes, scrambled eggs, breakfast burritos, to our famous Rock McMuffins. Lunch follows rest period, and weather permitting, we gather for the buffet-style meal under the tall pines in the grove. Campers make their own sandwiches with sliced meats, cheeses and toppings. Some of the campers’ favorite lunches include grilled cheese and tomato soup, shepherd’s pie, and Taco Tuesday and Pizza Friday. Giant salad bowls brim with fresh mixed greens and vegetables. Our evening Dinner requires each camper and staff member to be freshened up with a camp shirt neatly tucked in as we gather for a more formal dining experience. After an active day, boys look forward to hearty fare like lasagna, pot roast, chicken cordon bleu, or beef stroganoff. All entrees are accompanied by freshly steamed vegetables, salads and homemade breads. If a camper enjoys his first helping, there is always plenty for seconds. Daily desserts include fruit crisps, birthday cake or the hands-down favorite, ice cream sundaes. Snacks of fresh fruit, granola bars and Gatorade are provided throughout the day so that boys stay fueled and hydrated. With prior notification, the camp chef works hard to accommodate a number of dietary restrictions. Vegetarian options are always available. Meals at camp are about festivity and tradition as much as they are about food. 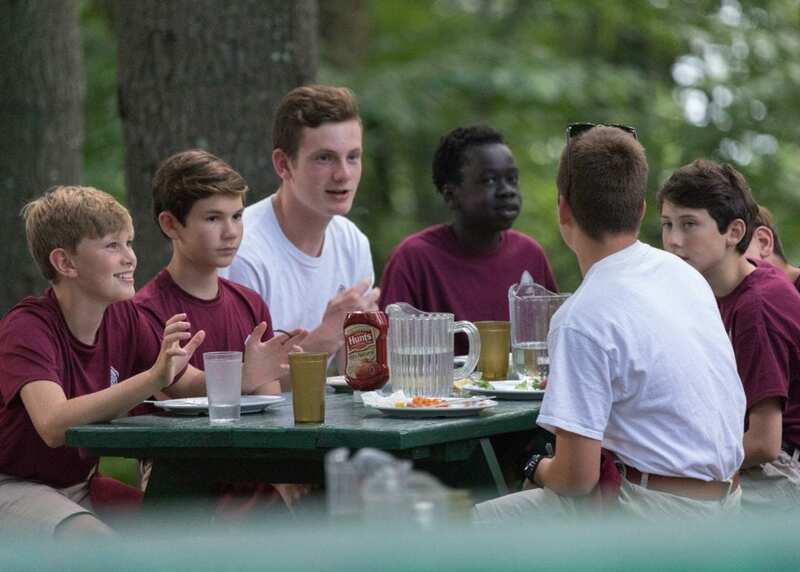 Every week a camper is assigned to a new table of eight boys and two staff members. The weekly rotation insures that the whole community gets to know one another, and campers of all ages take part in polite conversation (while mastering knife and fork and sitting up straight, napkin in lap). Table manners are alive and well at Birch Rock! The camper’s individual incidental account covers expenses for sundries, special camp excursions and articles purchased from the camp store. A bill will be issued for charges incurred over $100 per session at the end of your camper’s season ($200 for full season). If there are any restrictions on spending, please let the office know in advance. Each camper changes his clothes daily and bed sheets weekly. Birch Rock sends laundry out on Saturday to the local Laundromat and it is returned to the campers after breakfast on Sunday morning. Please mark all the camper’s belongings especially the laundry bag. (A laundry pen works best)! Laundry is included in the overall tuition cost. 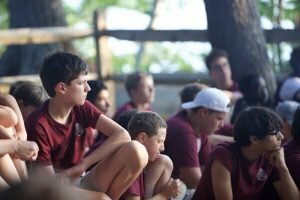 Birch Rock does have a uniform required (BRC maroon T-shirt & khaki shorts) on Saturdays & Sundays, day trips outside of camp and special occasions at camp. A BRC T-shirt is mandatory at dinner each night and off-campus during the summer. We believe dressing for our camp community family-style dinner provides a refreshed and collegial respite from the action-packed events of the day. The BRC maroon or ash (optional) T-shirts with the camp logo may be purchased from Maine Camp Outfitters. Although we do not specify or supply a specific carrier for khaki shorts, we like L.L. Bean’s in Freeport, Maine. The BRC Order Form for T-shirts, baseball hats, and camp sweat shirts is enclosed. Our daily dress code is casual and practical. No cut-off shorts, torn jeans or pierced earrings/rings or body jewelry are permitted. We strongly recommend waterproof hiking boots and rain wear for trips, day adventures and rainy days. Birch Rock is very proud to have a quality library and our head librarian, Pamela Stock for its campers. This is a long-standing tradition of the camp that was started by Mrs Brewster, Co Founder of the camp. 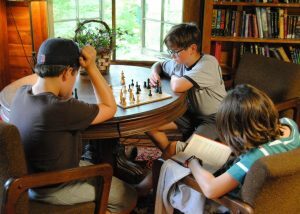 The camp encourages reading for pleasure and also has a quality selection of books & games from which to choose. If your son has a reading list for school, please inform the librarian and his counselor. One of the strongest benefits to the Birch Rock Community is our support & commitment to academic tutoring. Pam Stock & Sara Lavertu are our special education teachers and the camp’s librarians. For those campers who need the opportunity to boost reading levels, reinforce basic math skills or refine proofreading and writing skills, Pam & Sarah would be happy to design a structured program with you and your son. Tutoring is available for an additional charge and may be arranged directly with Pam @ (207) 461-5781 or by email. We feel strongly that positive cues and recognition are the cornerstone of a quality camp experience. Each day the BRC Community “Shares Success” and acknowledges both individual and group achievement. Additionally, activity charts in the main lodge record each camper’s progress in a specific skill, program and contribution to the community as a whole. At the end of each session, each camper will receive special recognition at our Award’s Ceremony with badges for his personal Birch Rock Banner! Birch Rock maintains an inventory of sundries & toiletries for the campers. Some of the items include: film, hygiene supplies, postage, batteries, bug spray, sunscreen, water bottles, and other small items that a camper may need for the summer may be purchased after lunch. Special services rendered, medicines, and sundries purchased through camp will be charged to the camper’s incidental account. Birch Rock feels strongly that our campers and staff be well-fed and nourished with a proper diet and hearty meals. We would appreciate your cooperation with this and ask that you not send candy/snacks to your son. Special treats like candy and soda are given to the community for special occasions – i.e. birthday, movie night, special event – and at the discretion of the Camp Directors. If you would like to send a special treat for your son, we ask that you send a treat or a contribution designated for the entire community. All treats will be stored in the camp office in order to ensure distribution. Please call the Camp Directors if you would like a special camp treat arranged on your son’s behalf. A great treat is your camper’s favorite ice cream! Each Birch Rock Camper will receive an evaluation from his cabin counselor with a message from the Camp Director at the end of the season. Additionally, the camp will provide an opportunity for each camper and his family to evaluate their summer experience at BRC. Please feel free to contact the Camp Director throughout the summer if you would like some immediate feedback. Campers love to get mail at camp! All forms of written contact are encouraged ESPECIALLY cards, letters, etc. E-mail: Messages and correspondence to the camp via electronic mail are accepted. However, campers do not have access to computers; and therefore, cannot reply electronically. We encourage letter writing as the primary means of communication. We will scan camper letters and email them to our foreign families by request. The camp e-mail address: birchrock@birchrock.org – Please place the camper’s name on the subject line. Please do not send any candy to the camp! Any candy discovered will be discarded by the office unless it is appropriate for an all camp community treat. We strongly believe candy treats can cause more harm than good. We appreciate community treats and would be happy to discuss options with you. Telephone: Birch Rock’s business line is (207) 583-4478. The camp does not allow campers to use the phone unless special circumstances dictate that it would be appropriate – i.e. birthday or family emergency. If a situation warrants a conversation with your child via the phone, please contact the Director and an arrangement may be made at a designated time. If families need to notify the camp about specific family situations and/or prolonged absences from their home, please contact the camp during the day. Cell phones are not permitted at camp (nor do they work in our region). A visit from families of our campers after a two-week adjustment period to the camp program is permissible but not always advisable. There are many campers who have come from overseas or across country who don’t have family in a short driving radius. The campers are at Birch Rock “to find their wings and fly.” If you feel you would like to visit your camper, please let us know in advance by phone (207) 583-4478 or via this form. In consideration of others, we respectively request that you do not bring your family dog(s) and/or other pets to visit as we do not want to cause any disruption to the community at large. We appreciate advance notice of your arrival. Birch Rock discourages taking campers off campus for visitation purposes. We recommend footlockers that can be positioned at the foot of the camper’s bunk. We recommend C&N Footlockers (offers our logo on their trunks, if requested) or Maine Outfitters. There is no need for our campers to have money or any type of valuables including: watches, radios, laptops and any type of electronic device………etc. (These items will be relinquished to the camp upon arrival). We are located in the beautiful foothills of the White Mountains and hear the cry of loons from dusk to dawn. We want our campers to thrive in the majestic environment of the natural world. The daily schedule is reviewed each morning with the camp community with a bell identifying the passage of time. We request all electronic devices remain at home. Each cabin counselor has a music device for his cabin, which is used at his discretion. Please leave all electronics at home! Each camper is responsible for bringing his own TWIN sheets, blankets, pillow and towels to camp. Beds and mattresses are provided. Pillows are not provided. We can provide bedding and pillows for campers coming to camp from overseas. We strongly recommend a footlocker/trunk for each camper. The footlocker is easily stored at the end of each camper’s bunk. Please be sure to mark your camper’s name on the trunk. If you are shipping footlockers/trunks to camp please do so by United Parcel Services or Federal Express.. If you would like us to ship your son’s trunk home at the end of the season, please provide us with the correct shipping address. We will bill you directly for the shipping and handling charges. All trunks must have a padlock in order to be shipped. Footlockers can be purchased from C&N Footlockers (800-535-2057). Campers are expected to leave camp on their respective departure date. Pick up time is between 10am – 12 noon. The BRC Staff will be standing by to say good-bye with luggage and awards in hand. Please check-out with the Camp Directors in the office prior to departure. All Birch Rock Boys leave camp with a clean trunk of clothes as long as they give their dirty clothes to their respective counselor in time! Birch Rock encourages families to arrive with their camper(s) between 10am – 12 noon on his respective arrival date. Please click here for directions to Birch Rock. We cordially invite you to tour the campus with a veteran Birch Rocker and join us for our opening Luncheon Buffet @ 12:30PM. All BRC staff personnel will be on hand to meet, greet and help your son(s) get settled for the camp season. If you need to arrive at a different time, please contact the camp.